In 2001 when Necrodynamic was released, Modern Melodeath was on a really big ascension with names like Soilwork and In Flames leading the pack. Night In Gales previous effort Nailwork was released in 2000 and while being a bit of an oddity, still had most of that 2000s’ melodeath touch. Criminally underrated stands Night In Gales Necrodynamic. It is often referred with a shrug as the weakest effort of a mediocre melodeath band. 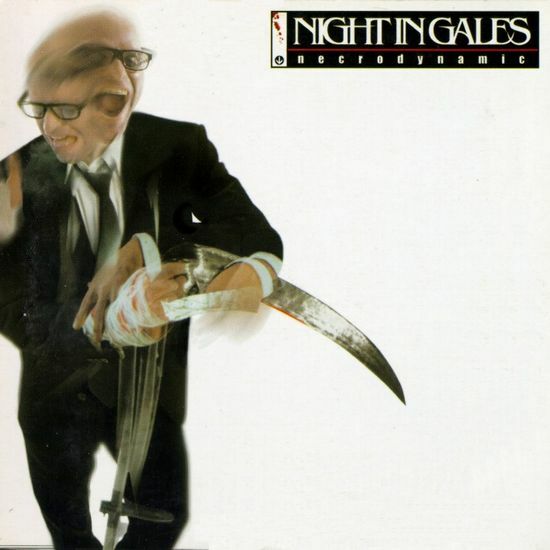 While it may be true that Night In Gales never were better than a mediocre melodeath band, they did succeed in composing memorable songs and good album entities. In Necrodynamic Night In Gales is probably as far from melodeath as they’ve ever been. Ironically lyrically they are almost only about death. The songs usually encompass a sort of thrash metal-edged drive with nicely raw and muddy sounds; far away from the typical “modern melodeath sound”, but still melodic and heavy. The songs have plenty of groove and while the lyrics aren’t filled with oddcompoundworks anymore; they are still pretty fun. I really got into Necrodynamic nearly 10 years ago and the song trinity Deathmouth Daisies, Song Of Something and Right From The Morgue is still as fun and rocking as they used to be. There are a lot of albums which I then thought as masterpieces but find hardship in appreciating now. Necrodynamic is still fresh. An album which I’ve always enjoyed and never mixed it up as being a masterpiece. It is the sort of album you may have heard about; but didn’t know how good it is. Hell, rest of Night in Gales albums were re-released in 2008, but not Necrodynamic. While it may be because of copyright reasons, it still does criminal injustice to the album. I think it was just the wrong time for a modern melodeath band to release an album which was not modern at all.